How to use Online portal: Just fill the 1. EPIC ID * , 2. Aadhaar UID* and 3. Mobile Number. After filling the form click on Generate OTP, you will receive a One Time Password from the given number to confirm the details. 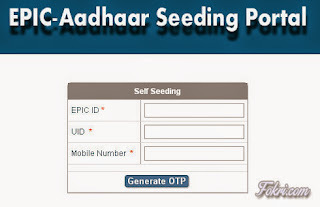 You can use Anroid application to link EPIC with Aadhaar UID can be download from Cheif Electoral Officer Website. Sending the Aadhaar Card number and Voter ID Card number SMS to 08790499899 in the following format. By calling to the call center number 1950 and furnishing the EPIC number and AADHAAR number to the operator.